Voted the #1 Family Resort in Mexico by Travel & Leisure magazine, this 418-room resort offers spacious guest accommodations and an extensive beach area, where the Caribbean's white-sand and turquoise waters create an optimally relaxing atmosphere. Located in one of Cancun's most romantic spots, it is the only hotel in Cancun authorized to conduct oceanfront Catholic weddings, making it an ideal location for your most memorable occasion. 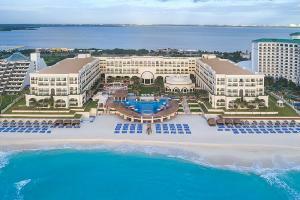 Ten miles from Cancun International Airport. La Capilla, La Isla, Mikado, Lobby Bar, Champions Sports Bar and Restaurant. Cozumel Island, Isla Mujeres, Mayan Ruins- Chichen Itza, Mayan Ruins- Tulum, Wet n Wild Water Park, Xcaret Nature Park, Xel-ha.